The idea that humankind is pretty much the end all be all as far as intelligent life goes is a pretty depressing thought. It's only natural, then, that we'd grasp on to pretty much anything as a sign of alien contact—seriously, anything. History is rife with reports of UFO sightings, but if you take a second to stop and think, nearly all of them come with perfectly reasonable explanations—and not one of them extraterrestrial. Consider this: It would take one of our space ships 60,000 years simply to reach the edge of our galaxy alone. Now, that doesn't bode well for an extraterrestrial playdate. But this hasn't deterred the hoards of people willing to swear until their dying day that they have seen, interacted with, touched, and/or been probed (anally or otherwise) by creatures of a world beyond our own. And sure, the thought that we're not alone is an exciting if not slightly unsettling one, but these little claims and subsequent "proofs" of alien life on Earth almost always fall into one of three categories: military exercises gone wrong, acts of nature, and of course, man-made hoaxes. Ever notice how UFO sightings tend to conveniently happen on or around military bases? Yeah, that's not a coincidence. Be it weather balloon, aerial spy cam, or rogue aircraft, people are more than happy to assume that the mystery circling overhead is alien—rather than military-made—especially during times of national paranoia. Times of paranoia like, say, WWII, for instance. After the attack on Pearl Harbor, the country's sense of security was shattered. So three months later, when a weather balloon went casually wafting over Los Angeles in 1942, hysteria naturally followed suit. What's a terrified city to do? Why, conduct a massive military airstrike against the interloper, of course—resulting in this iconic photograph of what was later dubbed The Battle of Los Angeles. Initially the shadow in the sky was thought to be another attack coming over from Japan, but at a press conference shortly after the incident, Secretary of the Navy Frank Knox quickly put that rumor to rest, calling it a "false alarm." Which then left media personnel free to publish all sorts of "reports" of extraterrestrial coverup. And remember—after WWII, people were shaken. They were ready to believe anything. One of the most notorious alleged UFO sightings (and the inspiration for a criminally underrated television show), Roswell, all started in July of 1947 when local ranch foreman William Brazel stumbled upon a giant ditch hundreds of feet long and filled with debris—namely rubber strips, tin foil, paper, scotch tape, and toughened sticks. Stanton Friedman, a physicist and amateur ufologist (it's a word), was one of those noble crusaders for the alien origins explanation—it's just that he decided to wait a good 30 years before weighing in because, well, no one really knows why. After interviewing Major Jesse Marcel—one of the site's original inspectors—in 1978, Friedman got what he was looking for. Marcel claimed that the entire event was a military coverup of an alien spaceship. Bingo! Because there was so much controversy over what actually happened, two separate official government investigations took place—one in 1994 and the other in 1995. The first confirmed that the cause had indeed been a weather balloon; the military was testing them in a classified program that used sensitive lights to try to detect Russian nuclear tests. The second cleared up that whole "dead bodies" issue; the test had used dummies during parachute testing, dummies which then had to be removed. After Roswell, interest in potential alien spacecrafts skyrocketed, with almost 800 sightings occurring in the weeks that directly followed. As with the Battle of Los Angeles, the international climate probably played a role; this was mid-Cold War, when Americans were well-primed for a little extra paranoia and perpetual fear. While photographs of UFOs are now are relatively rare and met with considerable skepticism, back then, the claims were accepted in droves. Each UFO sighting was merely another log tossed on top of an already hefty pile of anxiety-inducing fodder. Lieutenant Edward Ruppelt from the Air Force's Project Blue Book (the government agency set up for the express purpose of UFO investigations) analyzed the images and ultimately declared them not to be a hoax—but he didn't believe them to be of alien origin, either. Rather Ruppelt believed that the vision had been nothing more than streetlights being reflected off the underbellies of a flock of plovers. Witnesses in the area supported this explanation, agreeing that they had in fact seen large flocks of migratory birds and had even her some squawking. In 1917, 30,000 people in Fatima, Portugal supposedly witnessed the "Miracle of the Sun," an event that was supposed to predict the appearance of the Virgin Mary. Crowds gathered to find themselves staring at a cloudy sky for hours. But when the clouds finally did part and the sun came bearing down, everybody simultaneously experienced radiating, multicolored lights that came spiraling downwards. And cue collective panic... now. Of course, soon, nearly everyone with any sort of connection to the event began claiming that it had to be a hoax. Santili, then, admitted that most of the "original footage" was of such terrible quality that he just had to have portions reshot by reenacting the supposedly actual events—a sort I Didn't Know I Was Pregnant except instead of babies you have E.T. 's entrails. Eventually, artist and sculptor John Humphreys also came clean, admitting that he'd constructed two extraterrestrial bodies and filled them with a tasty little mixture of sheep's brains, jelly (flavor unspecified), chicken entrails, and knuckle joints. You know, alien stuff. But it's not just our gullible, less-jaded grandparents that fell for UFO scares. As recently as 2009, the residents of Morris Count New Jersey spent January and February mystified over five strange lights that consistently appeared in the night sky. Even workers in control towers couldn't figure out where the lights were coming from—nothing showed up on their radars. So of course, the next logical conclusion was aliens. 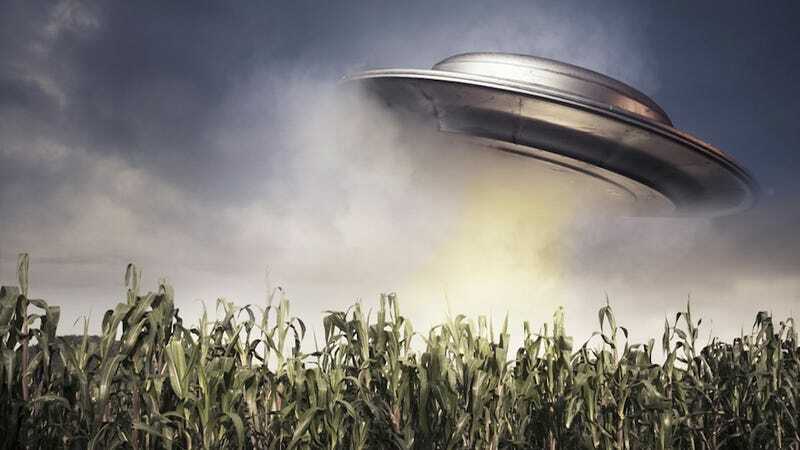 Since we know for 100 percent certain what actually happened in this case, the extent and variety of people's reactions proved just how unreliable and inconsistent people's accounts of alien sightings can be. Though there had been nothing more than a few hovering lights, some people claimed to have never seen anything quite so scary in their lives; some outright refused to believe the cause had been balloons; and one man even insisted that he had seen nine, scattered lights eventually come together in a line and start communicating with one another. So no matter how sincere the story may sound, people are absurdly unreliable narrators when it comes to an alien encounter.